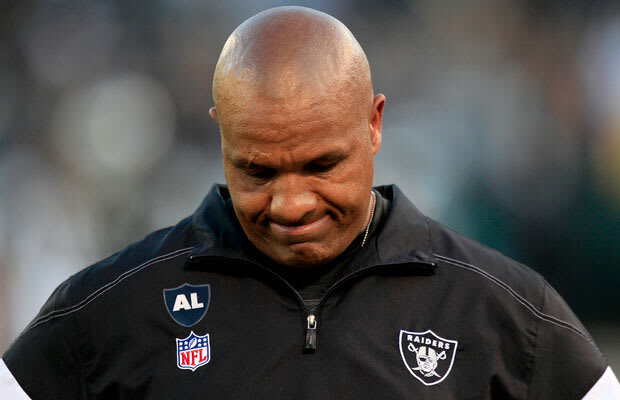 With only a single season under his belt, Hue Jackson was fired by the Oakland Raiders, according to ESPN&apos;s Adam Schefter. The Raiders started 7-4 this year, but dropped four of their last five games and narrowly missed the playoffs. Oakland dealt with multiple setbacks, including star running back Darren McFadden missing nine full games because of a foot injury, and quarterback Jason Campbell missing 11 with a broken collarbone. The injuries resulted in a mid-season trade for Carson Palmer, the Raiders giving up a first-round pick in 2012 and a second-round pick in 2013. Dealing with a constantly banged up receiving corps, Palmer threw for 2,753 yards, 13 touchdowns and 16 interceptions. The decision to dump Jackson comes days after the Raiders hired new general manager Reggie McKenzie, who spent 19 years in the Green Bay Packers&apos; personnel department. Longtime Oakland owner Al Davis, who died in October, was famed for canning coaches quickly, and it seems the new regime is taking up his legacy. There is no word yet on possible candidates to fill the position.